Execute Automations when you are away from your machine by running WinAutomation in Unattended mode. WinAutomation supports bot Attended and Unattended Automation. In the Attended Automation the user is supposed to be present on the machine and the process may interact with the him through different dialog boxes for data entry or decision making when needed. The Unattended mode, on the other hand, covers any situation where the Processes need to start because of a Triger or a Schedule, when the workstation is Locked or the user is not Logged-in. 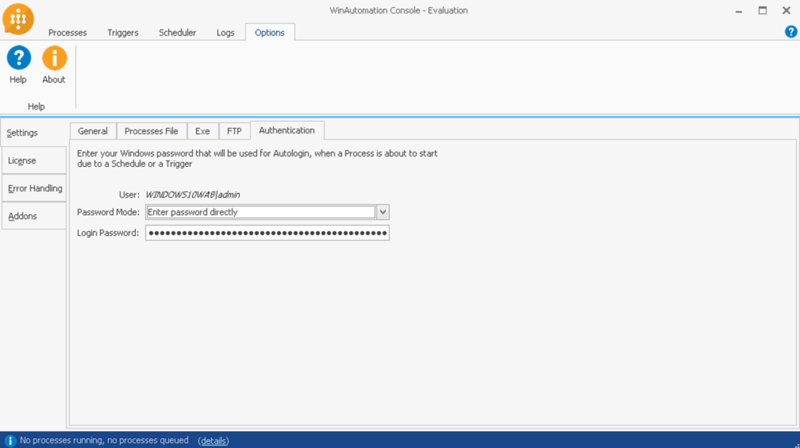 WinAutomation can login or unlock your computer and start executing your processes when it should. Configure your Process, assign Triggers or Schedules to it and when an event occurs or the times comes, it Logs-in and executes. 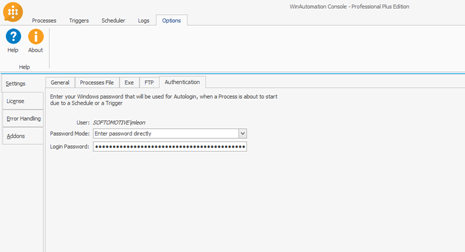 All you need to do is provide your account password in the WinAutomation console once and for all. Your info will be safely kept and encrypted to be used only for your Unattended Processes. Use the run policy option to select what happens when a process needs to start in an unattended mode when, for instance, the workstation is locked, the user is not logged in or another user is already logged in. This schedules auto login, the task to be completed and log out so your PC can act on autopilot to get the work done even when you are not there.